In 3-quart saucepan, heat oil over medium heat. Add garlic, onions and carrots; cook 4 minutes, stirring occasionally. Stir in remaining ingredients. Heat to boiling; reduce heat. Cover; simmer about 10 minutes, stirring occasionally, until carrots and noodles are tender. Remove bay leaf. Kitchen Tips Running short of time? Use shredded or julienne-cut carrots from a bag. To ensure even cooking, cut vegetables so they are similar in size. Rice and pasta absorb liquid so you may want to cook them separately and add to soup just before serving. Refrigerate soups in shallow containers so they cool rapidly. Once completely cooled, cover tightly. Refrigerate most soups with vegetables or meat no more than 3 days. 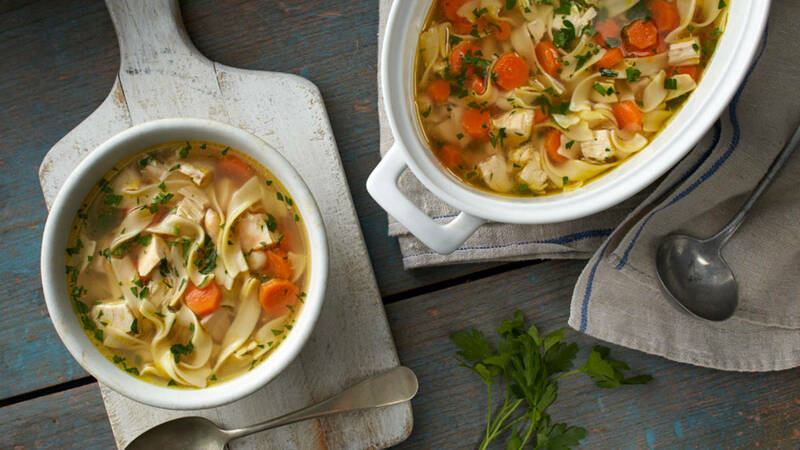 Most broth-based soups freeze well for up to 6 months. Pour soup into freezer containers, leaving 1/4 to 1/2 inch headspace because soups expand as they freeze. Reheat broth-based soups over medium heat, stirring occasionally, until hot. Or reheat in the microwave.